In 2008 the Minnesota Land Trust became one of the first land trusts in the country to be accredited by the Land Trust Alliance Accreditation Commission. 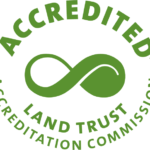 Accreditation means that this land trust abides by the Land Trust Standards and Practices and operates in an ethical, legal and technically sound manner. Learn about accreditation from the Land Trust Alliance. As a publicly supported organization, the Minnesota Land Trust believes in the appropriate disclosure of its financial data. Please use the links below to view recent tax returns and financial audits (requires Adobe Reader).